This week saw plenty of transfers to Premier League clubs as we’re now only one week away from the start of the new season. The major transfer that happened was, of course, Chris Samba returning to Anzhi, just 6 months after he had left to join QPR. You could say Anzhi have done well out of this due to buying him for €500k less than what they sold him for. However once Samba had left Anzhi in January, he left a gaping hole in the Anzhi defence of which ultimately cost them in the race for not only the title but a Champions League place. And you also have to remember that money isn’t really an object for Anzhi, so the €500k isn’t going to make a difference to them apart from pay Samba’s wages for a few months. Elsewhere Djibril Cisse made a surprise move to the RPL with a move to Krasnodar side Kuban on a free transfer, signing a one year deal with the option for a one year extention. Kuban aren’t known for going for big name players on high wages, however Cisse is a good addition to the side who, providing he stays relatively fit, should get goals in the league and provide some much needed experience for their upcoming Europa League campaign. 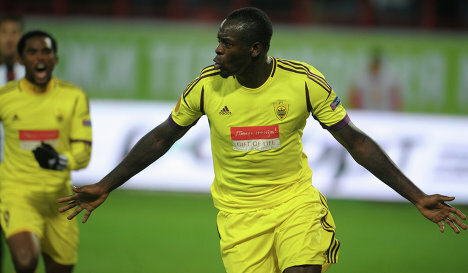 Meanwhile Kuban’s city rivals Krasnodar, completed the signing of striker Gerard Gohou on a free transfer. Gohou scored 19 times in 31 games for Turkish side Kayseri Erciyesspor. Krasnodar also sold goalkeeper Yevgeni Gorodov to fellow RPL side Terek. Champions CSKA completed the signing of the highly rated Bulgarian midfielder, Georgi Milanov for around €3m. CSKA also signed 21 year old midfielder Steven Zuber from Swiss club Grasshoppers, both players have signed five year deals with the club. Finally, Rostov have loaned midfielder Jano Ananidze and striker Artem Dzyuba from Spartak Moscow until the end of the season. These two players could be very shrewd business by the club and will definitely be beneficial to the players who should get some much needed game time.